You are here: Home / Crew Confessions / Yacht Stewardess Confession: I LOVED shopping for the yacht. 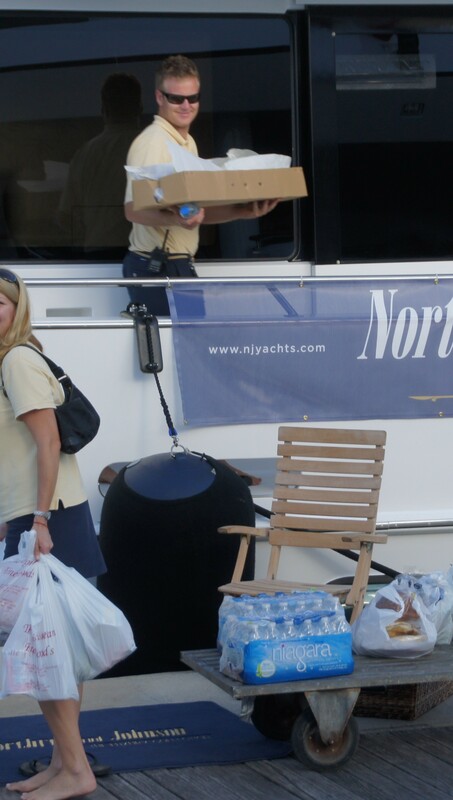 Yacht Stewardess Confession: I LOVED shopping for the yacht. As a yacht steward/ess, part of managing the interior of a superyacht is guaranteeing that everything a guest would need is onboard—from manicure sets to shoe horns to Pepto Bismol. The good news is the stews get to shop for it all. The bad news is this responsibility is a bit more stressful than you might think. After all, if the guests want to play poker, and you don’t have a deck of cards, it’s your fault. No hair rollers onboard? Well, what terrible service! Yes, when shopping for a yacht, you have to think of everything. 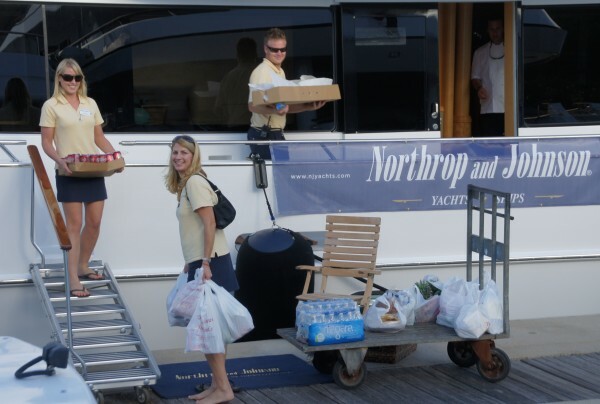 Superyacht crew bringing provisions onboard after a shopping trip. Photo Copyright: Suki Finnerty of YachtingToday.TV. I loved shopping for the yacht. We (my chief stew at the time and I) managed to spend $18,000 in one day buying new items for the yacht’s interior: crystal glassware replacements, chinaware breakfast sets with napkins and table linens to match, 100 new DVDs, 50 new CDs, new serving plates, two new vacuums (Dyson! ), and an assortment of fine liquor—top-shelf everything! We got to wear our interior-decorator hats, too, as we picked out candles galore, flower vases, breakfast napkins, and decorative throw pillows. Talk about a spree; we got to buy so much crap, it was awesome! And believe it or not, we came out under budget. Another time, when our yacht was on the island of Malta in the Mediterranean, we didn’t have a crew car, so I had to be taxied around all day by a local yacht agent in search of last-minute items for an upcoming charter. View to Vittoriosa Harbor, Valletta, capital of Malta, with superyachts in port. While it’s a beautiful and historic island, Malta is NOT the most ideal place to shop for hard-to-find items needed on a yacht charter. Our shopping excursion was like being on a scavenger hunt. He told me there was no way we’d find them. But darn it, I needed them to pull off this Broadway-themed party; the guests were bringing a professional pianist onboard, and we were told they loved show tunes. I begged him to try. Every stop we made, I’d leave him in the car with his cell phone, as he called upon his list of contacts. 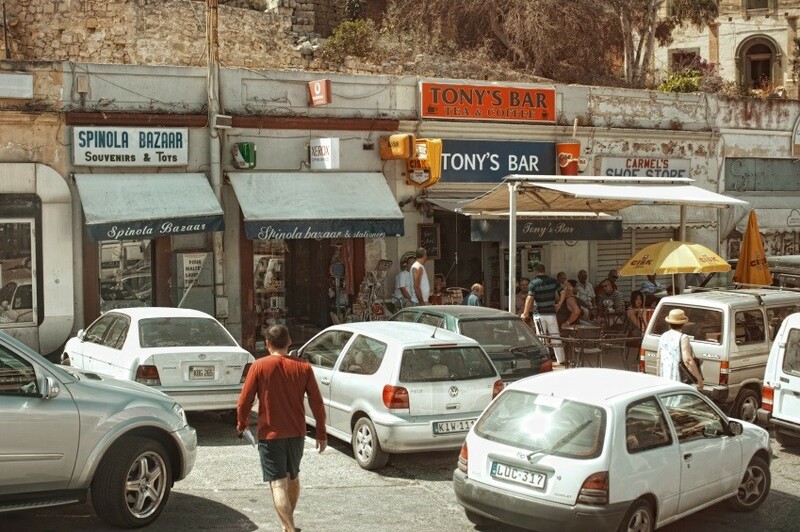 Valletta, Malta – Typical maltese street with shops, parked cars and lots of people resting at the bar. It wasn’t until the very last hour of our time together that he got the call: Someone had white Christmas lights in a storage unit! Even better, when we got there, I discovered he had a lot more than that. I climbed back onboard the yacht that evening carrying a life-sized, stand-up cut-out of Marilyn Monroe in Times Square, a poster of the Statue of Liberty, and a mini replica of the Empire State Building. Yep, “Broadway night” turned into “New York, New York night.” And the guests who joined us the following week could not have been more pleased with the results of my day shopping in Malta! Julie Perry in her days as a yacht stewardess, decorating for a Broadway-themed party for charter guests.